Winter weather certainly has remained in the news this post-Valentine’s Day week. It’s been another major snow event in the Northeast, heavy snow from southern Illinois and Missouri to the south into Kentucky and adjacent states and freezing rain and ice, especially in Georgia, North Carolina and other states in the southeast. Multiple highway fatalities have occurred and over 100,000 people have lost power, mostly due to ice. Bitterly cold temperatures are plunging far into the south on the date this is posted, February 18, 2015. We’ve written about heavy snow several times and we’ll revisit the topic of how climate change may affect that snowfall, but today we’ll focus on freezing rain, ice storms and “black ice,” all of which are being experienced in parts of the south and southeast this week. According to the National Weather Service freezing rain and sleet occur when raindrops in a layer of warm air well above the surface fall into a layer of freezing air at and near ground level. 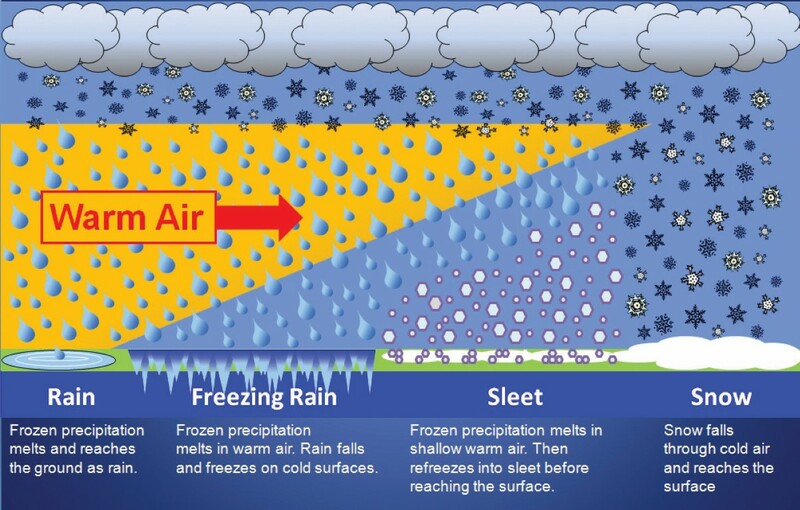 Whether the liquid ends up as freezing rain or sleet is determined by the thickness of the layer of freezing air. When that layer is thin, the raindrops don’t have time to freeze so the water freezes on contact with the surface, coating streets, sidewalks, power lines, tree limbs and whatever else is exposed and below freezing. Complicating the situation this week is bitter cold temperatures to follow the snow and ice. A freezing rain event is escalated to an Ice Storm Warning when ice accumulations of ¼ inch or more are expected. The National Weather Service considers ice storms to be high impact events and if you’ve lived through one or more, you know that to be true. Ice storms can occur across a wide area of the United States and can be very devastating. The single most destructive weather event ever to occur here in Champaign-Urbana, Illinois was the Valentine’s Day ice storm of 1990. The 25th anniversary of the event passed largely unobserved last weekend. Seemingly no one wants to relive that week. The storm began during a home basketball game at the University of Illinois and ice quickly accumulated. The lights in the Assembly Hall flickered, but stayed on. I was the public address announcer that night and I vividly recall being handed a series of announcements to be read if the main power went off. The final announcement I did read was that game attendees should expect that many traffic signals would be out of commission across town after the game. When I left the Hall I could see the flashes and hear the explosions as electrical transformers failed. I drove the few blocks to the radio station where I worked at the time. It was operating on generator power. We started to cover the event and things just got worse during the overnight. At one point around 2:00AM I decided to go check on my family and home. I followed a snowplow down a main street as it pushed trees and branches out of the road so emergency vehicles could get through. I turned down my street as limbs were falling behind me and decided to just keep going back to work before the street was completely blocked. 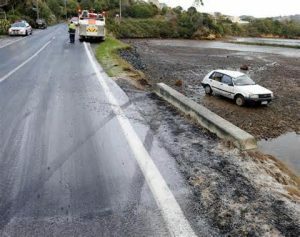 Some areas of town were without power for a week. Damage to utility infrastructure, trees, traffic signs and signals and buildings and homes reached into the millions of dollars not counting the loss of productivity and dumpster loads of ruined refrigerated and frozen food. I relate that account not because it was unusual, but rather because it is typical of major ice events. They can be extremely destructive and expensive. Black ice can be every bit as dangerous as a heavy snow or ice storm. It is a very thin layer of ice that is nearly transparent. It frequently forms on bridges and overpasses because that pavement temperature may be colder as the cold air circulates above and below the pavement. Black ice often occurs when snow melts during the day and then the water refreezes at night. Or the temperature drops below freezing after a rainy day. Unlike during an ice storm, black ice is a much greater threat to pedestrians and vehicles than to structures. Multi-vehicle accidents are common when the pavement refreezes and emergency rooms are kept busy treating pedestrians who slip and fall. Next PostNext Weather Wednesday: Just what the heck is going on with this winter?